K-9 Is Headed To The Cinema! | Warped Factor - Words in the Key of Geek. K-9 Is Headed To The Cinema! ...And he's coming face to face with Omega! 2017 marks the 40th anniversary of the first appearance of the Doctor's robot-mutt, K-9. Loved by many, he got his own spin-off in 1981, made a triumphant return during the Tenth Doctor's era and then moved to Australia, had an extreme make-over and headed up some piss-poor, brightly-coloured kids nonsense. And now he's getting a movie. Because... demand? K9, the world’s most famous robot dog traverses the dimensions of space and time to become the latest robot star of the big screen! Having made his TV debut nearly forty years ago in the 1977 Doctor Who TV serial “The Invisible Enemy” K9 went on to become one of the most iconic characters from the BBC series. A new look high tech K9 for today’s cinema is being prepared for film stardom. The film “K9-TIMEQUAKE” has been written by one of K9’s original creators; Bob Baker, a renowned writer of classic Doctor Who serials. Bob went on to co-write with Nick Park the Oscar and Bafta winning Wallace & Gromit series of film shorts as well as the feature film The Curse of the Were-Rabbit. The new K9 will be appearing in a multi-million dollar movie which promises to be a great action adventure set in deep space. The film will be full of dashing heroes and heroines, androids, monstrous aliens and an ultimate foe who will also be familiar to Doctor Who fans everywhere; the megalomaniac OMEGA. The film is to be a UK co-production with exteriors filmed overseas and studio work planned for the UK. K9 is the perfect character to star in a movie with a whole new bunch of action heroes making this a home grown Star Wars come Guardians of the Galaxy style cinema must see film. The film is currently slated for release in 2017 which will be K9’s fortieth birthday! At this time, let me just point out that no, it's not April 1st. Big promises though, "Star Wars come Guardians of the Galaxy style"? Hmmm. 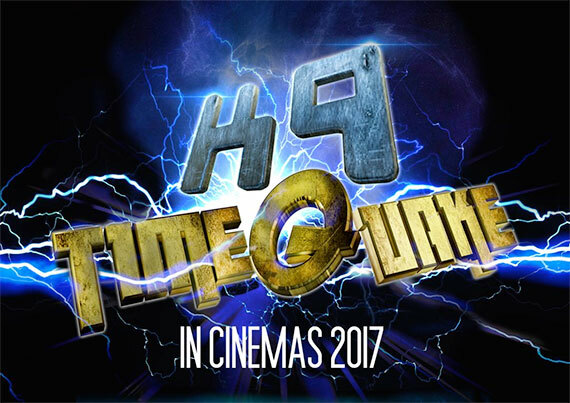 K-9: TimeQuake arrives in 2017. The BBC are not involved, so fear not - it's won't be canon!